Food Costs > How Much Does Ricotta Cheese Cost? How Much Does Ricotta Cheese Cost? Ricotta cheese is an Italian whey cheese produced from either a cow, sheep, goat or even water buffalo. This cheese is made by thickening the proteins that settle after the casein has been used to create the cheese. Ricotta will be creamy white and is sweeter in taste when compared to other cheese. Depending on the brand, the fat content will vary. On average, authentic ricotta cheese in its raw form can range anywhere from $6 to $18 per pound. The cost to purchase ricotta cheese will often depend on the animal’s milk used (cows, sheep or goats), the brand and where it’s from. Ricotta impastata, a high quality of ricotta cheese, is often very hard to find as it’s only made in one region in Sicily. If found, this type can be much more, often in the $30 per pound range. 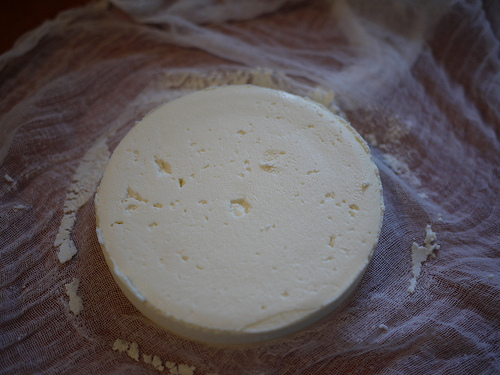 Ricotta Salata cheese, a pressed, salted, dried and aged variety will be milky-white, firm and will commonly be used for grating. This type of cheese, for example, can cost about $7 to $14 per pound from reputable retailers. Ricotta cheese, often found in 16 to 32-ounce plastic containers, commonly in the refrigerated section, will cost $1.50 to $5 per container. Again, the prices will depend on the brand and where you purchase it. Walmart’s Great Value brand, for instance, retails for less than $2 per 16-ounces, whereas a name brand, such as Galbani, will be closer to $4 per 32 ounces. Ricotta, in its fresh form, will be creamy white in character, similar to that of cottage cheese, and will have a slightly sweet taste. Depending on the label and the kind of milk being used, the fat content will change. Fresh ricotta can go through an additional production process to allow it to have a much longer shelf life. This can include, according to Wikipedia, baking, smoking or further fermenting it. Popular ricotta cheese brands include Sorrento, Calabro, Polly-O, Organic Valley, Galbani, Tofutti and White Rose. A one cup serving will contain close to 428 calories and 32 grams of fat. The majority of the fat — close to 20 grams — will come from saturated fat. Part-skim, however, will have less fat and fewer calories per serving, usually around 339 calories per cup and 19 grams of fat. One serving will contain 125 milligrams of cholesterol, while part-skim will have 76 milligrams. A fat-free version has 60 milligrams. As for carbohydrates and protein, one serving will have 7.5 grams of carbohydrates and 28 grams of protein. One serving has 206 milligrams of sodium, with part-skim and fat-free varieties containing significantly more, close to 600 milligrams. Ricotta can commonly found in dishes, including cheesecakes, cannolis, pasta, calzones, strombolis, pizza, lasagna, manicotti, and ravioli. BuzzFeed, for instance, lists 13 delicious ways to use it. If purchasing in a plastic container, the grocery store brand will, almost always, have the same ingredients and can cost 20 to 30 percent less. Buying in bulk at a local wholesale club can often bring the costs down quite a bit. For example, Costco sells a five-pound container for less than $10, effectively bringing the costs down to $0.80 per ounce. Consider making your own ricotta cheese. While it sounds difficult, it can be done by using a gallon of milk and heavy cream. SpringsBargains.com explains how it can be done for a lot less than buying ricotta cheese at the local grocery store. Wow $50 for a small half pound of ricotta cheese was a rip off. Wasn’t enough. Really walmert?